What difficulties and emotions do software developers experience during their work? When is a developer "in the flow" and making a lot of progress? So far, little is known about these kinds of questions or the cognitive and emotional states of developers during work. Researchers have predominantly focused on the tangible output of developers' work, such as the source code, to identify bug-prone parts. Yet, a better understanding of what developers experience in their work would allow us to provide better and instantaneous support to developers, for instance by avoiding costly interruptions when a developer is in the flow or by intervening when a developer perceives particularly high difficulty levels and might be close to implementing a bug into the code. Recent advances in biometric (aka psychophysiological) sensor technology in combination with research in psychology show promise that biometric data can fill this gap and provide answers to some of these kinds of questions. For instance, measures of a person's skin conductivity (aka EDA)—how much a person is sweating—can tell us something about the person's stress level and cognitive effort, but also perceived emotions. In our research, we investigate the use of biometric measurements in the context of software engineering. In particular, we conduct studies ranging from short controlled lab studies to several week long field studies in which we examine the link between a developer's biometric measures and cognitive and emotional aspects of a developer while working on a change task, such as the perceived difficulty of source code elements or tasks, and the emotions and progress the developer experiences. Our vision is to use biometric measurements to gain a better understanding of what developers experience in their work and to use this improved understanding to better support developers. To study the potential of biometrics to predict developers' perceived progress and emotions (valence), for example, we conducted a lab study  with 17 participants from two companies and one university. For this study, we collected biometric data, such as EDA, or the heart rate of participating developers while they were working on two different change tasks. At the same time, we asked developers in periodic intervals to self-report their perceived progress and emotions, specifically valence and arousal (on two scales from -200 to +200). The following figure highlights some of the collected data, with the biometric EDA and heart rate data on top and the self-reported valence and progress on bottom. 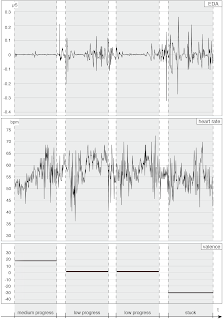 The figure also illustrates a visible difference in the biometric data, in particularly in the EDA signal, between the first episode that was rated as medium progress and higher valence compared to the last episode with the developer reporting being stuck and a lower valence. To analyze the data, we performed several steps of data cleaning, noise filtering and feature extraction, before we could feed these features into a machine learning classifier. The results of our analysis show that biometric data can be used well to distinguish between positive and negative emotions, as well as between phases of low and high progress, in most cases. Overall, the results of our three studies (, , ) show that we are able to predict aspects of developers' cognitive and emotional states in real-time using biometrics. The results also show that we are able to make accurate predictions in the field in the common work environment of professional software developers and over multiple days. Not surprisingly, biometric data is very sensitive to the individual and certain biometric measures work better for some than for others. By using an approach that takes into account these individual differences more explicitly, we should be able to further improve our results in the future. So what can we do with these insights? Similar to other metrics, such as code metrics or interaction metrics, biometrics can be leveraged to provide better support to developers, even in real-time. The results of our latest study  show that we can use biometrics to predict where quality concerns are or will occur while developers are still working on the change task, and that the biometrics even outperform more traditional metrics. These insights can now be used to enhance existing tool support, such as the automatic detection of quality concerns, to highlight and rank places in the code that should be reviewed and/or refactored, or even to indicate to the developer when he/she should reconsider a change to prevent him/her from ever submitting code with errors to the repository. Similarly, we can use biometrics to provide better interruption management support for developers or to provide recommendations when a developer perceives difficulty, ranging from talking to a coworker to taking a break. In summary, the results of our studies are promising and provide initial evidence that biometrics can be used to assess cognitive and emotional states of a developer and thus help answer some of the open questions. As one example, our results show that we might be able to support developers when they are experiencing difficulties and help them to fix quality concerns early on. With the rapid and continuous advances in sensor technologies and the increasing pervasiveness of smart wearable devices that already collect biometric data, we might soon be able to leverage this kind of data for each professional software developer and fine-tune our classifiers to further increase their accuracy. At the same time, this opens up many ethical and privacy concerns that will have to be addressed and investigated in further studies. 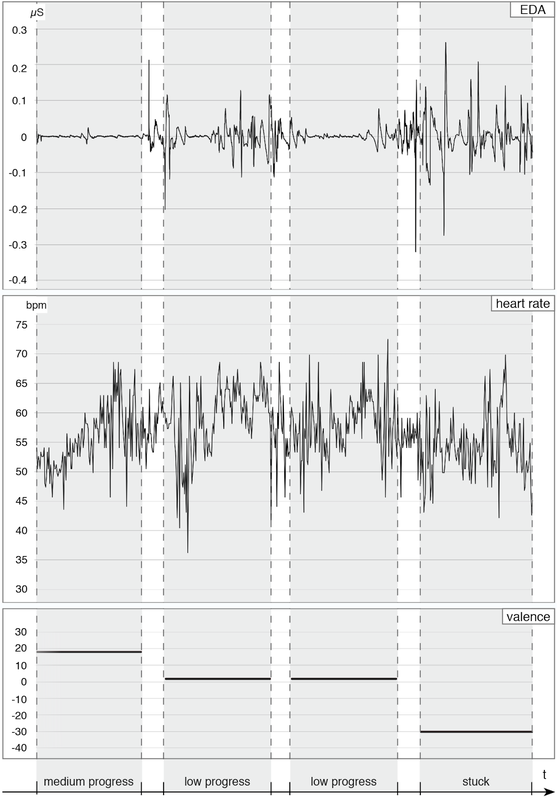 Ikutani, Y. and Uwano, H. Brain activity measurement during program comprehension with NIRS. In Proceedings of the International Conference on Software Engineering, Artificial Intelligence, Networking and Parallel/Distributed Computing. 2014. Nakagawa, T., Kamei, Y., Uwano, H., Monden, A., Matsumoto, K., and German, D. M. Quantifying programmers' mental workload during program comprehension based on cerebral blood flow measurement: A controlled experiment. In Companion Proceedings of International Conference on Software Engineering. 2014. Parnin, C. Subvocalization - toward hearing the inner thoughts of developers. In Proceedings of the International Conference on Program Comprehension. 2011. Siegmund, J., Kästner, C., Apel, S., Parnin, C., Bethmann, A., Leich, T., Saake, G., and Brechmann, A. Understanding understanding source code with functional magnetic resonance imaging. In Proceedings of the 36th International Conference on Software Engineering. 2014.